Ashok Leyland is banking on new, innovative products to augment its market share. 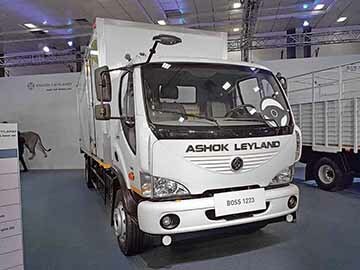 Ashok Leyland is banking on new, innovative products to continue growing. Preparing to launch 30 new products to further augment its performance across light, medium and heavy segments, the Hinduja Group company, claiming to have earned a price premium on over one lakh trucks sold with ‘intelligent’ EGR technology in FY2017-18, is pursuing a vision of getting in the global top ten manufacturers of trucks and the global top five manufacturers of buses. Stating that the company is the fourth biggest manufacturer of buses and the 13th biggest manufacturer of trucks, Vinod K. Dasari, Managing Director, Ashok Leyland, described FY2017-18 as an interesting year. “The Supreme Court put a ban on the sale of BSIII vehicles. With the ‘intelligent’ EGR tech up our sleeve, we could support our channel partners to counter the challenge. We could convert BSIII vehicles to BSIV and whatever remained were exported. It was painful, but we could tackle it successfully unlike many others who had to take a significant hit,” he expressed. Terming FY2017-18 as a year of aggressive competition, Dasari mentioned, “It is necessary to look at how high the margins are rather than how high the discounts are.” Having earmarked Rs.1000 crore for capital expenditure, Ashok Leyland is banking on products that will address the changing requirements of transporters and fleet operators. 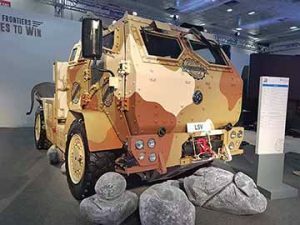 It is aggressively bidding for defense contracts involving the mobility needs of the Indian Army, riding alongside its US-based partner Lockheed Martin. Winning an order for 10×10 high mobility vehicles (valued at Rs.100 crores) to carry the Smerch Rockets from the Ministry of Defence (MoD), Government of India, Ashok Leyland, said Dasari, has won 12 out of the 15 tenders it participated in last year. Announcing that there was acerbic competition against the EGR, Dasari averred, “We offered an innovative product range then, and will continue to do so.” Displaying 50 new elements, including trucks, buses, defence vehicles, spare parts, network and service initiatives, telematics initiatives, gensets and powertrains, at Chennai recently, the company hinted at a growth strategy that is limited not just to India or just to CVs, but to a wide range of offerings, and in markets outside of India like the Middle East, Africa, Ukraine and Russia. Highlighting the ambition as well as the ability to invade Euro5 markets like Russia and Ukraine with the supply of left-hand drive Boss 1223 (with 12-tonne GVW and SCR exhaust after treatment) with heated cabin and heated rearview mirrors, out of the 50 elements Ashok Leyland displayed, a good number were left-hand drive CVs in the form of trucks and buses. They underlined the company’s stress on exports and the ambition to gain a firm footing in some of the fast-growing overseas markets. 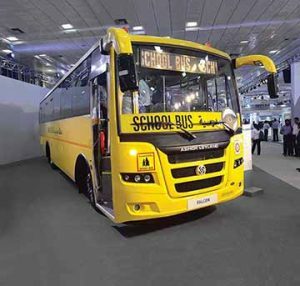 Out of the left-hand drive Partner (with 6500 Kg GVW), (24-seater) Mitr bus, (33-seater) Oyster air-conditioned staff bus, and (47-seater) Falcon school bus with three-point seatbelts Ashok Leyland displayed, the Falcon and Oyster are made at Ashok Leyland’s Ras Al Khaima (RAK) facility in the Middle East, which was established in 2010 as a joint venture between Ashok Leyland and the Ras Al Khaimah Investment Authority at an estimated investment of USD 50 million, and an initial capacity to build 2000 buses and trucks. 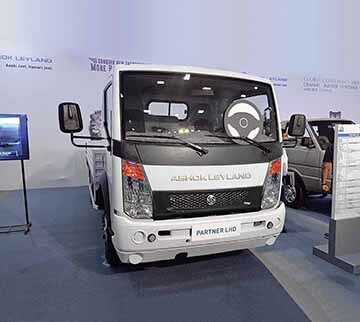 Doubling up the RAK capacity, Ashok Leyland, in a bid create a new production record, is pursuing its overseas ambitions by creating the Bangladesh plant with a local partner to gain a local edge. Announced Dasari, that the company has achieved record production levels in Bangladesh. So much so, that the production was ramped up. The new target is set for 200 to 400 vehicles per week. Investing in a substantial operation at Dubai, and in the Ivory Coast to tap the Middle East and African markets, the company has also invested in operations in Nepal and Kenya. The strategy to expand international footprint is being followed through dealerships, local assembly plants, new products and more. Over 750 units of the Oyster have already been sold in the overseas market. The Sunshine school bus and the Captain heavy truck range has been introduced in Nepal. These vehicles, according to Dasari, have been positioned at the same price point as the Japanese vehicles, and are continuing to perform well. 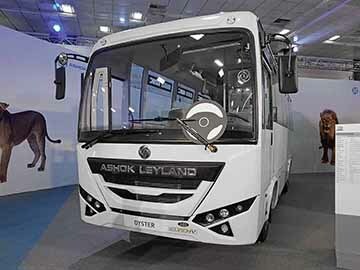 Faced with severe production constraints last year, Ashok Leyland enacted a substantial change. Experiencing a 5x change (read growth) in 10×2 trucks made in the period between Q1 and Q4 last year, influenced by GST and the hub and spoke transportation model, the company clocked a growth of 19 per cent by selling 158,612 units last year. It was slightly less than the industry growth of 20 per cent. An estimated 856453 CVs were sold last year. 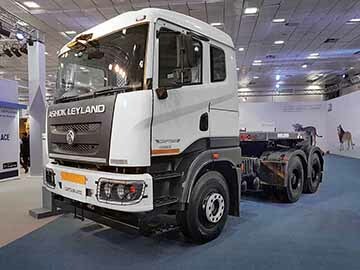 Responding to market needs by launching the 3718 and 3718 Plus multi-axle rigid truck models of 37-tonnes GVW each, Ashok Leyland made substantial changes to the production capacity to tackle constraints. “We had to increase the capacity overnight. The production of the nine-speed gearbox was quadrupled” informed Dasari. Figuring out a way to hike the production of heavy trucks, Ashok Leyland experienced a good upswing in the North Indian markets. From 18000 numbers in Q1, the market rose to 43000 by Q4. It marked a substantial change. In earlier instances, the company would lose market share when the northern markets saw an upswing and the southern markets shrunk. The same did not happen this time, according to Dasari, and the upswing in northern markets actually worked to the advantage of the company. Making a substantial investment in network overtime, Ashok Leyland, said Dasari, has been able to hold on to the market share of 34 per cent because of a solid growth in the northern markets. “It is there that we have grown our network,” he averred. The upswing in northern markets benefitting Ashok Leyland, what really helped were the efforts taken over the last five years to significantly expand the network not just in north India, but all across the country. An innovative strategy to commission 3S, 1S dealerships and quick-service motorcycle mounted teams is claimed to have helped further. Pushing digital initiatives like iAlert telematics platform that looks far beyond track and trace, LeyAssist, LeyKart, and Servicemandi, Ashok Leyland performed its first digital transaction in August 2017. “Since our first digital transaction in August 2017, we have bridged the 50,000th transaction mark in March 2018. Operating only across three routes, we reached in March alone a Servicemandi run rate of Rs.100 crores. We created a Rs.100 crore business in six months, and we are hoping it to grow to Rs.500 crores next year,” Dasari revealed. Claiming to retain the market share despite aggressive competition and irrational discounting, Ashok Leyland, with a focus on dealer profitability, is driving initiatives like Maxserve. These are said to have not just led to a substantial improvement in dealer profitability, but in customer satisfaction as well. “Our dealers were selling Rs.500 to Rs.600 crore worth of service two-to-three years ago. The service revenues have doubled through the Maxserve initiative,” stated Dasari. The other, and a big initiative from the company to expand its reach as well as the market share is the introduction to up to 30 new products, including a 41-tonne rigid 10×2 haulage truck with a 10-tonne parallelogram type four-wheel (high) lift axle. Aimed at those who are looking for a rigid multi-axle truck with a GVW of more than 37-tonnes, the 41-tonne truck, called the 4123 will be launched later this year and incorporates a number of innovations like just two greasing points, adjustable torque rod on the live axle, a 213 cc compressor, and slipper suspension from Meritor. 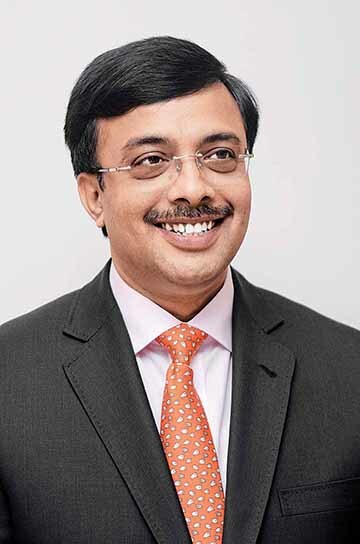 Employing a unitised front axle, the 4123, according to Dr. N Saravanan, Senior Vice President – Product Development, Ashok Leyland, offers higher payload (up to 3.8-tonne more) and is cost-efficient. “We have managed to ensure higher payload without adding too much weight to the lift axle despite having to lift four wheels. To ensure optimum tyre life, we have developed a system where the lift axle slightly lifts when the truck is taking a turn of over 30-degrees at slow speeds. The bellows automatically deflate to ensure this,” explained Dr. Saravanan. Describing the 4123 as a higher payload and low maintenance model, Dr. Saravanan, mentioned that the truck is easy to manoeuvre. Terming the Indian market as weird when asked if a 40-tonne prime mover trailer combination will make more economic sense than to have such a rigid truck, he mentioned that the tractor-trailer market is evolving, and will take some time to gain in efficiency. In the area of gas propelled CVs, Dr Saravanan informed that electric CVs may not make sense from a payload point of view. “On a 25-tonne vehicle for example, the battery capacity is so high that a significant amount of payload will be lost. The thought process in CVs, therefore, is to have electric and other propulsion systems like fuel cell, LNG, CNG, or diesel. LNG or CNG can be had as a standalone propulsion medium too. The challenge is in the supply chain,” expressed Dr. Saravanan. With the move to Euro6, he said that CVs will become much cleaner; cleaner than CNG without the need to deal with the challenges associated with CNG. 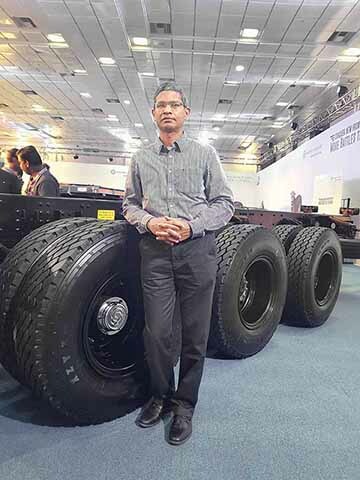 Hinting at Ashok Leyland looking at LNG bus applications, Dr. Saravanan said that he was hoping for an upshift from 37-tonnes and a shift from 40-tonne tractor-trailer segment to a 41-tonne rigid multi-axle truck like the 4123 in applications like cement. “There is a higher payload advantage the 4123 could offer,” he concluded.